Friends troll each other on social media all the time. But two celebs are doing it to each other in order to show the world they have a strong bromance brewing. 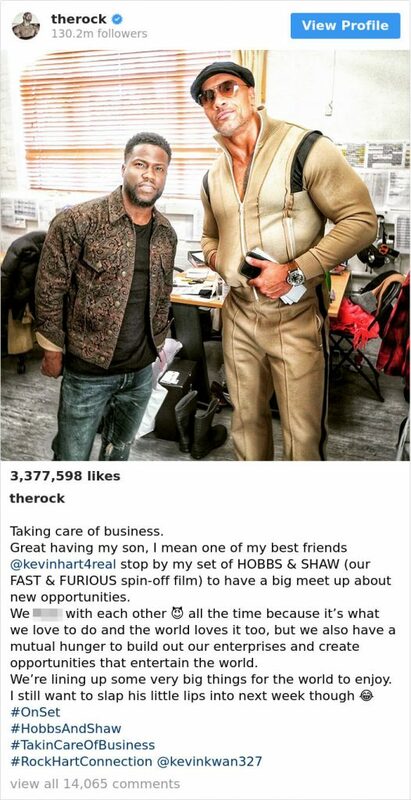 Kevin Hart and The Rock were hilarious in the movie, “Central Intelligence.” But they’re even funnier when they troll each other. Take a look! 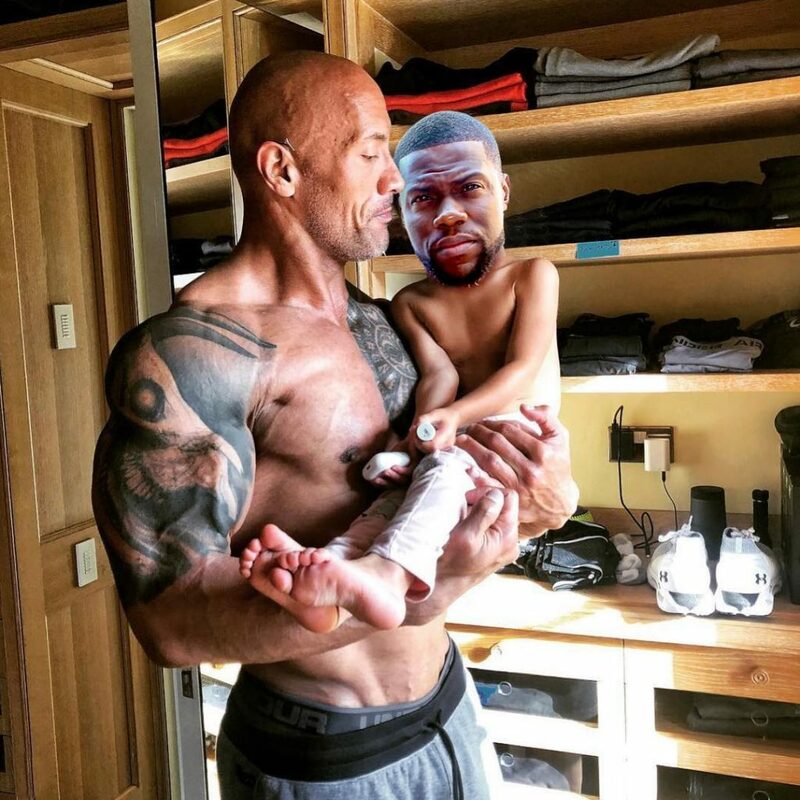 It’s no secret that Kevin Hart is tinier than The Rock, (he’s 5 foot 4) There’s even a long-running joke that Hart is his kid. 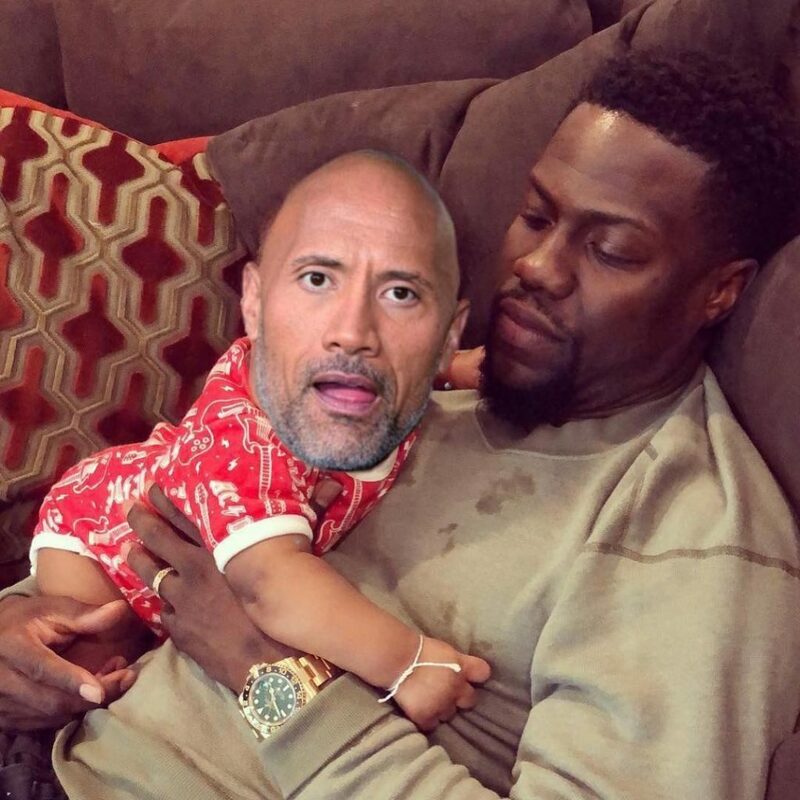 So, The Rock stuck Hart’s face on the photo of a child he was holding and asked people online to get out and vote. 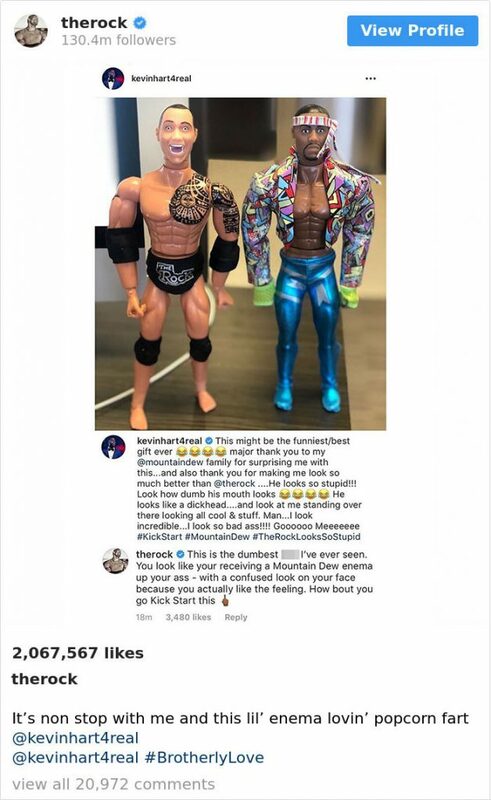 When Kevin Hart got doll-size versions of himself and The Rock courtesy of Mountain Dew, Hart thought it was the funniest gift ever. But The Rock had a different take, and you’d swear from his response that these two are enemies. But he was just expressing some brotherly love. When they’re not trolling each other, the internet will do it for them. But Hart doesn’t mind posting photos that show how extremely funny their size difference makes them because they both make the best of it. Hart shared this little tidbit that gave “Jumanji” fans hope for a sequel. 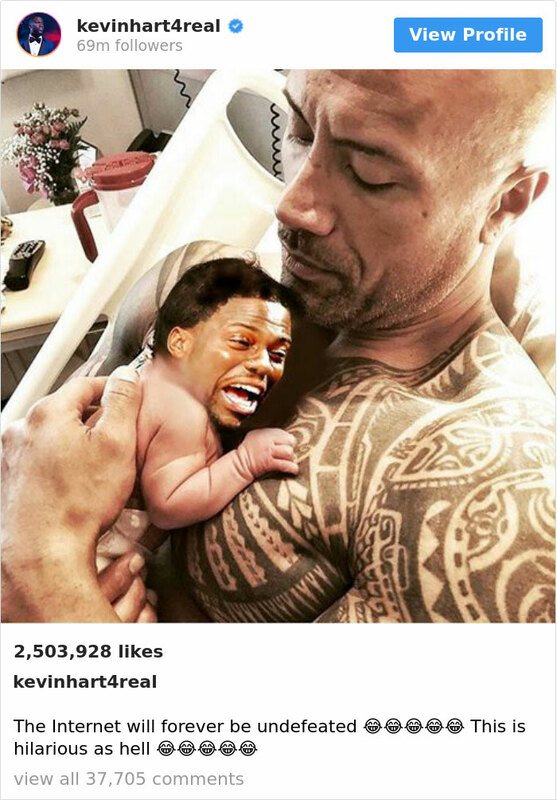 Meanwhile, the photo he posted of a baby version of The Rock being held by him is sort of adorable. Hart even named him Baby Big Head. 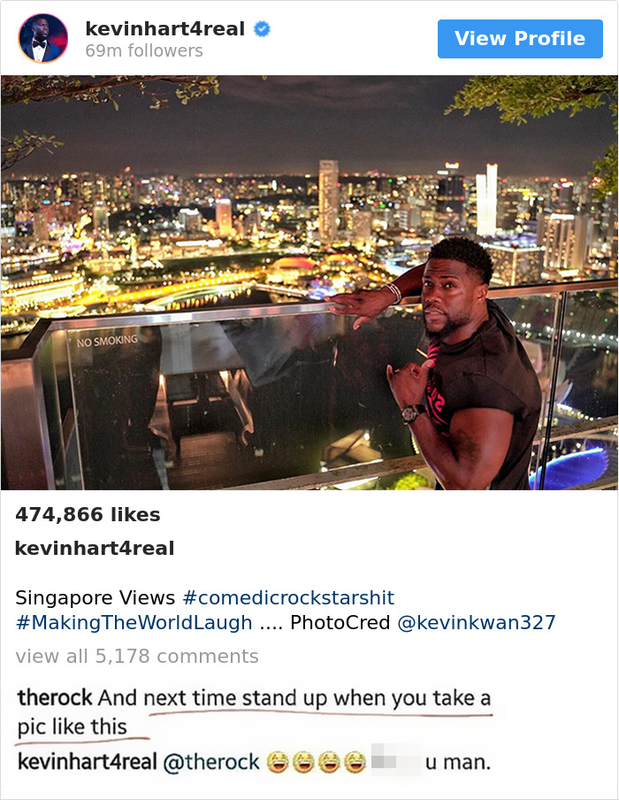 When Kevin Hart posted this photo of himself standing by a balcony in front of a gorgeous cityscape, The Rock suggested he try standing up next time. But as you can see from his response, Hart was laughing his head off. 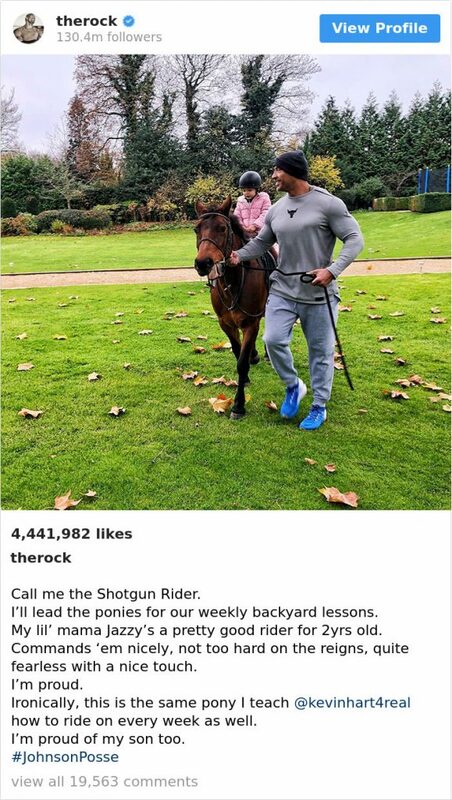 It might seem like these two have a love/hate relationship just from reading the caption The Rock wrote. But that’s just bro language for “I love you.” We’d love to see these two doing more movies together or maybe a sitcom. Seriously, is anyone in Hollywood looking into this? Fans are weighing in on the constant back and forth trolling Hart and The Rock are doing. Netizens are falling head over heel in love with these two, who are totally bromancing the internet one post at a time. Some folks might think these two are being a bit immature or they might take it as they’re dissing each other. But we love their hilarious bantering. They should probably make a “Central Intelligence 2” that involves them walking around the city teasing each other. We’d absolute watch that!